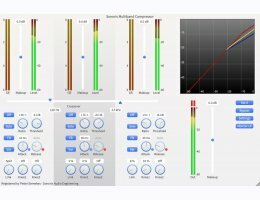 The Sonoris Multiband Compressor (=SMBC) is a versatile three band compressor in VST, VST3, AU, AAX and RTAS format for Windows and Mac. It is an ultra clean processor, suitable for delicate material. It has three independent frequency bands, each followed by a compressor based on the Sonoris Mastering Compressor. The three bands are created with carefully designed Linkwitz-Riley crossover filters to avoid phase cancellation problems while having a very natural, analog like quality. By design they mix back flat. Unlike linear phase filters they don’t introduce ringing artifacts and are more efficient in use. Besides working on a full mix, each filter band can also work on the Left, Right, Mid or Side channels or anything in between, with the variable link. This feature turns the SMBC into a powerful problem solver enabling you to exclusively attack a specific problem in a mix. For example, taming the bass in the Mid channel or a snare hit in the Left channel at 3KHz while keeping the integrity of the mix intact. Request your Demo Here of the Multiband Compressor.